When making a formal offer on a property in Costa Rica, it is highly recommended that you get a complete home inspection. You want to ask the home inspector to start his inspection as soon as your offer is accepted by the seller. Contacting a home inspector before having an accepted offer from the seller is a waste of time, money and effort. 1. To find out if the property needs any serious replacements such as a roof, retainer walls, plumbing or electrical systems, or if there is any structural damage. It is also possible a home has serious termite damage. 2. To make a list of smaller repairs that can be done before you move in. A home inspection might make or break a real estate purchase. Sometimes, a home inspector delivers a report with bad results. Maybe you’d hate that to happen, but if it saves you from buying a bad property, then the home inspector has done his job. You could also use the inspection report to re-negotiate the purchase. 1. Are you familiar with Costa Rican building standards and codes as well as North American building standards? A U.S.-licensed home inspector will probably not know anything about the local building codes and building materials used. And a local civil engineer will probably not know anything about the building standards you are used to. 2. Will your home inspection explain in the report anything you find that might comply with Costa Rican construction standards but not with the usual North American standards? I would like to know the specifics about anything that might be different than what I would expect to find in a North American home. 3. How experienced are you? 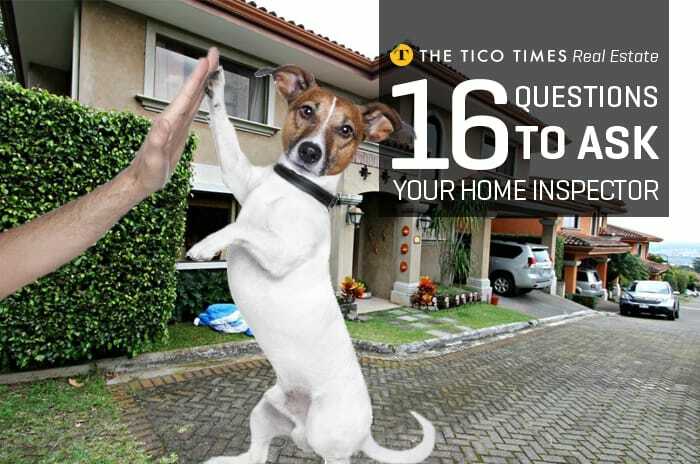 How long have you been doing home inspections? Have you worked with reputable real estate agents? 4. Do you keep your expertise up to date? There are always new construction systems, new materials being introduced in the market. Do you have the necessary knowledge about paint, mold protection, roofing and construction materials like marble, granite and others? 5. Is your focus on residential inspection or commercial construction? 6. Will you do inspections on drainage, septic systems, the swimming pool and its equipment? Will you do a termite and mold inspection? 7. When you do a home inspection on a condominium or gated community, are common areas included in your report? 8. How do you check for roof and gutter leaks when it doesn’t rain? 9. Do you offer repairs and improvements or are you able to make a referral when repairs are needed? 10. Are there any parts of the structure that you do not cover in your home inspection? 11. How long will the inspection take? How long will it take to receive the report? A thorough home inspection on a typical single-family house takes three to four hours. When the property is larger or has additional structures, additional time might be necessary. 12. Do you need a copy of the property survey and building plans if they are available? 13. What is the cost of a home inspection? Do you have a choice of varied reports? Can you send me sample reports? Does the inspection report depend on the size of the property, the size and age of the home, and the scope of services? 14. Can I attend the inspection? Most home inspectors will prefer to work on their own, as there will be a lot of delay when you’re there. If you can, give the home inspector a list of details you would like to have included in his inspection. 15. Will you be available for any necessary discussion on the report? Well there be any extra charges for that? 16. Will you do a second inspection after repairs are made? What will be your charges? As a real estate broker, I insist my agents recommend a home inspection to every property buyer. There are not many home inspectors in Costa Rica. Try not to use an architect or civil engineer for a home inspection; they will try to get you to build a new house.